Students have a lot to consider when they decide to study abroad, from selecting when and where they want to go to how they are going to pay for it. But for LGBT students, the search has an added layer of complexity because they also have to consider the host country’s attitude towards lesbian, gay, bisexual and transgender people. While the United States is neither extremely progressive nor conservative regarding LGBT rights, other nations have different views towards the LGBT community which, according to Delfin Bautista, director of the Ohio University LGBT Center, can be both more or less accepting. In some places, like many European nations, LGBT people have more rights than in the U.S., while in other places like Iran, homosexuality is punishable by death. 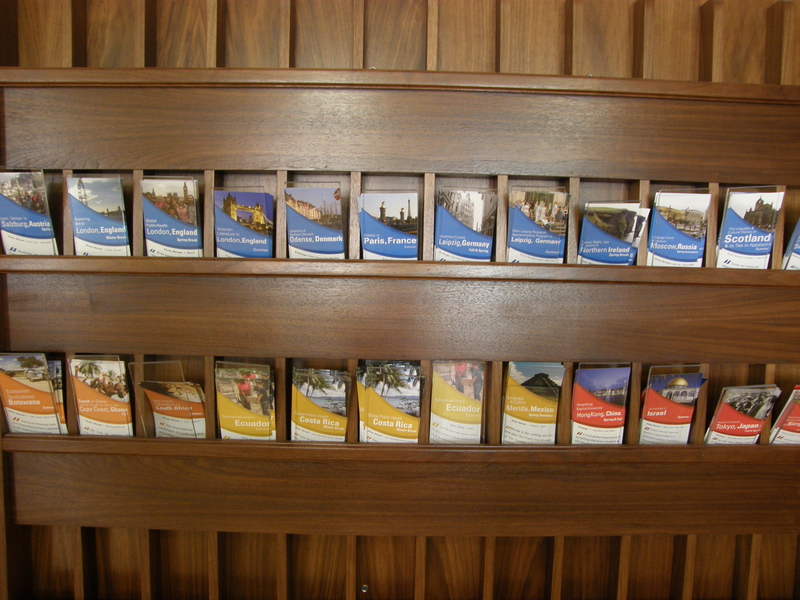 Along the wall in the Walter International Education Center, a series of pamphlets give information on different study abroad programs. 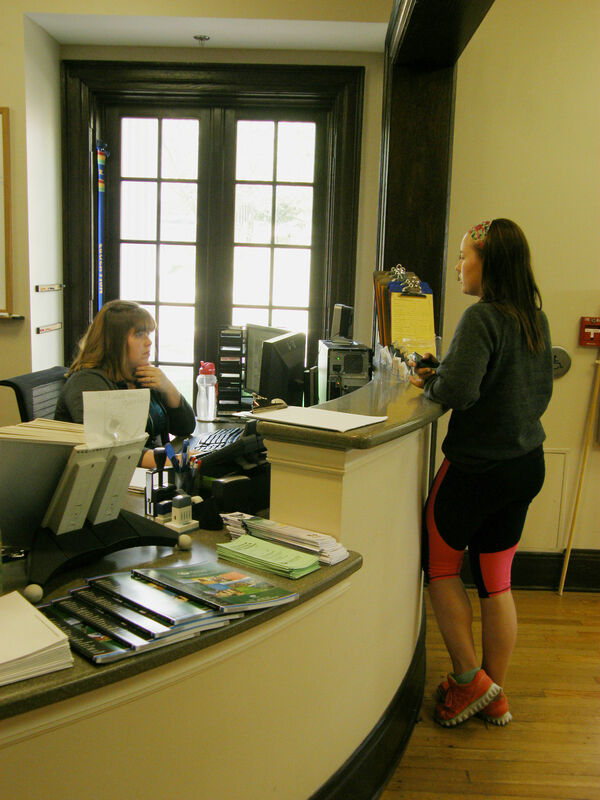 The center can be a good place for students seeking information on studying abroad. Because of this, it is important for students to research and be aware of certain factors before making a final decision. Catherine Cutcher, Program Director for Ohio University’s Office of Education Abroad, believes that one of the differences students need to consider is how their self-expression will be received by another culture. Transgender students or students who don’t consider themselves strictly male or female also have to think about how closely they match what is on their identification card. “One of the things to keep in mind is having to go through airport and then customs and that one’s ID may not necessarily reflect who they are… having to go through identifying as a female, but my license and my passport say I’m a male [could cause problems],” Bautista said. Besides dealing with security, transgender students also need to consider how their choice in host country will affect access to any needed medication. “If you’re going through a gender transition and you need to have access to hormones, it might be difficult to access the same kind of medications you have access to here in the U.S.,” Cutcher said. Junior Alyssa Nedrow, a photo journalism major, checks the status of one of her study abroad applications at the Walter International Education Center. Students can walk in Monday through Friday from 1:00 to 4:00 pm for advising on education abroad with no appointment necessary. Although some countries may be more difficult for LGBT students to visit, others are more accepting of LGBT people than the United States. This can provide students studying abroad with an eye-opening experience juxtaposing America with their host country. Bautista also noted how an LGBT student could notice the difference, even to the point of feeling more welcome in their host country than their home. Another experience a student may have that is different from culture in the U.S. is the acceptance of people who consider themselves as a mix of male and female. Even in countries that are perceived to be critical of LGBT people, there could be communities or movements that could help support study abroad students. “There are other countries where one has to be very careful, but even within those countries you may be surprised at some of the things that are happening, that it is not all doom and gloom,” Bautista said. To find these groups, students may need to look outside of their study abroad program which, according to Cutcher, may not be the best resource to direct students to such places, especially if the staff in the host country is not accepting of LGBT people. One resource for students studying abroad is New York University’s Q-Chat, an anonymous online chat-room that meets in various places around the world. Other resources can be found through the Ohio University’s Education Abroad webpage, and the Office of Education Abroad will also hold a presentation about LGBT travel safety from 12:00 to 1:00 pm. on Tues. Oct. 15 at the LGBT Center. But set aside any considerations LGBT students should think about and the bottom line for anyone studying abroad is to learn and grow. Bautista adds that the different experience students might have abroad could help promote better LGBT relations in America.